Before starting the HCG program there are a few things that you must have before the protocol can begin. Each morning when you wake up, you will need to weight yourself and record your progress. Without an accurate scale you may not catch the important fluctuations in your weight and correct them in time. All of the protein for your diet such as meats, fish, chicken etc. Must be weighed raw before preparation of meals. It is best to wait until you have all of your supplies as well as your HCG before you start. These sticks can be found at most drug or health stores and are important for tracking the fat burning process of your body. All protein for this diet is to be steamed, grilled or broiled. I found that one of the most efficient ways to cook protein is with a George Forman type grill or a Broiling Pan. One important part of the HCG Diet is portion control. How do you know how much of each item you can have? 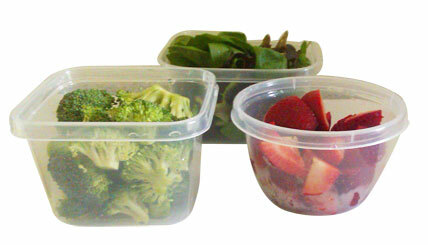 One way is to use some small containers that hold approximately the appropriate amount of fruits and vegetables. Our comprehensive diet kit comes with 3 containers that are the perfect sizes for portion control. Is such a low Calorie diet safe? In doing the HCG diet you will notice the low calorie diet menu set forth by the designers of the protocol. When looking at the limit of 500 calories per day most people are shocked and feel that this type of starvation can’t be safe. People, especially Americans have become very unhealthy and spoiled when it comes to calories. Most people eat more the 2000 calories per day. So when comparing 2000 to 500, it tends to scare some people. The truth is this, when in-taking 2000 calories per day, the body takes what it needs in nutrients and burns what it can based on your height, weight, metabolism, and daily activity. Everyone is different, so a person’s body can be programmed to burn for 1200-2000 calories a day. However whatever your body can’t burn it stores resulting in weight gain. Some people encounter a very low metabolic rate due to lack of exercise or just hormonal issues like thyroid problems. But in evaluating a 2000 calorie item, let’s take something like a cheese burger for example. The actual nutrients in that item might be as little as 10% of that burger. That means that the rest of the burger is being stored. A person might think that their body will burn it off but by introducing low nutrient intake, the body will lose the energy needed to burn off everything it encounters. Again, is it safe to only intake 500 calories per day? Yes, understanding that the calories you are in taking are pure nutrients. This now seems more plausible considering that when evaluating your daily calorie intake of 2000 calories, only 300-500 of those calories might actually be usable burnable nutrients. In the HCG diet you are feeding you body all the nutrients it needs and skipping over the storage phase of your bodies process. In doing this when your body looks for food to burn it has no choice but to turn to the old food you have stored in your body. So in a sense you are getting more then 500 calories per day, it’s just your body is getting the rest of the calories you don’t provide on its own. It is important when doing any diet that you do your homework and make sure that diet is for you. Because of the big craze in the HCG market you will find suppliers all over the internet claiming that their version is the best and most effective. Research brand names and Google reviews before ordering to avoid any disappointment in faulty products. We live in a crazy world where people will sell anything to make a quick buck. Please don’t go buy an unknown substance by a faulty website which might result in health problems. I am now encountering many people who are doing the Homeopathic form of HCG just to witness similar or even better results than other forms.